Use a mallet to lightly pound the pork cutlets. Combine ingredients (A) with 200ml water. 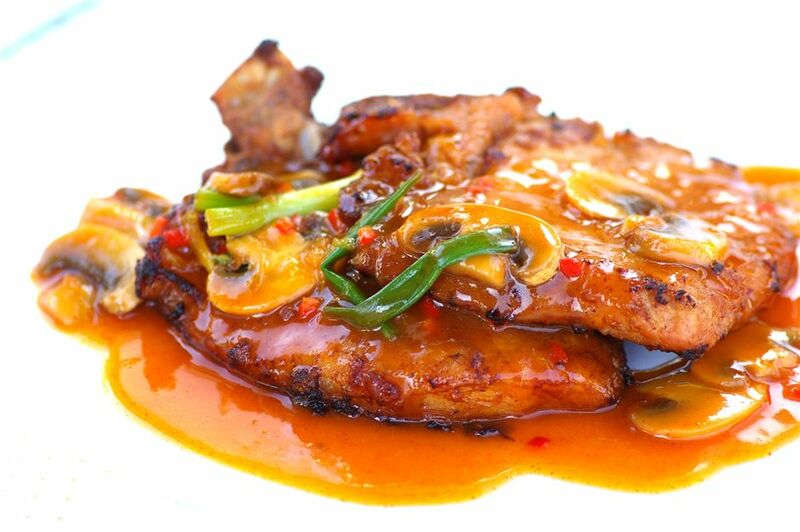 Place pork chops in the mixture and leave aside for at least 30 minutes. Drain the meat well then season with marinade (B) for four to five hours or preferably overnight in the refrigerator. Just before frying the meat, add one teaspoon oil. Stir-fry the pork cutlets in a heated nonstick wok until meat is cooked through. Dish out and place chops on a serving plate. Combine sauce (C) ingredients in a saucepan. Add button mushrooms and cook to a quick simmering bowl. Put in spring onion and chopped chilli. Stir-fry well. Dish out and pour over the pork chops.